There are many unnamed heroes walking on this earth without even being recognized for their heroic actions. Of course, I am not talking about the Ninja Turtles that hide in the dark to protect the beloved New York from all possible villains, but one individual who finally comes out of the shadows capable of saving one hundred and fifty-five lives with no need of a single gun in his hand – the US Airway pilot Chesley ‘Sully’ Sullenberger. Clint Eastwood’s Sully follows the event which occurred back in January 15, 2009 when airline captain, Chesley Sullenberger III overnight turns into a national hero after a successful emergency landing of an airplane in the Hudson River. Despite knowing many facts about the miraculous day, the film evolves around the untold part of the story when the investigation committee had to determine whether the decision made by the pilot was the wrong or right thing to do in order to save people’s lives. 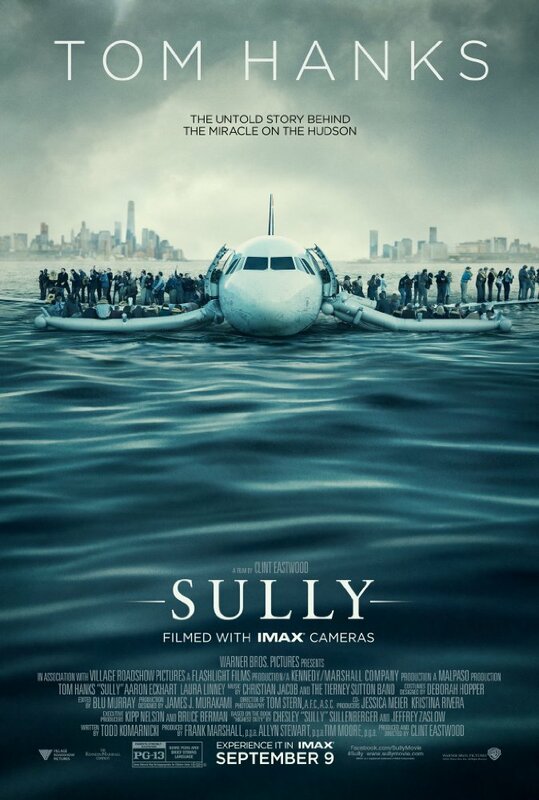 The film begins with Sully’s (Tom Hanks) nightmare, where he helplessly watches how his airplane crashes. But once he wakes up, you see that, we are taken a few days forward when Sully and the second pilot Jeff Skiles (Aaron Eckhart) try to handle an extreme interest from media, as well as defending their action in a very difficult situation. The feeling or, rather, the fear that you may miss in the film is one of the most impossible thing that ever happened in the aviation history, moments when captain decides to land the plane in the Hudson River, quickly disappears. As the story unfolds, you find cleverly executed narrative where you get a chance to observe the landing in the Hudson river from three different perspectives, which, I am afraid, I can’t say much to not give away an important structure of Sully, Eastwood chooses to follow. But trust me, it is worth keeping away from you, for you to admire it as you watch it endlessly. However, if you ever had a chance to listen to a real conversation between the pilot and dispatcher, then I am sure you will be thankful for having a great cast, who handles a sensitive moment in a way, in case you’re a New Yorker, will be proud of. The film, of course, touches a different side of the story that happens right after when a decision should have been made, and simulator were used to determine if Sully was right by sending the multi-million jet on the river to save lives. Those scenes, when the pilots try to simulate the exact steps performed by the pilots is truly priceless and a true indication of that, by making one critical decision out of millions is important when it’s needed most – which Sully does with confidence. In conclusion, Sully is one of those films that will make you feel proud of living in the time when someone like Chesley ‘Sully’ Sullenberger does anything possible to save the passenger’s life. It’s a film which will help you to restructure your actions or rebuild yourself to become a better human being the way we all want to be. Tom Hanks as Sully is impeccable. Aaron Eckhart’s solid performance brings Jeff Skiles well-deserved recognition, as someone who any of us could rely on him our lives. Clint Eastwood, which is impossible not to mention here, originally from California, directs his film as a real New Yorker, with love, respect and admiration by telling the story of “the miracle in the Hudson” in a way you could not imagine otherwise. Everything about Sully is moving and profound by showing that any of you can end up to be a subject of the film – for that, you don’t need to land the airplane safely, but to give a hand in when it needs most – the way best of New York did within 25 minutes.